"Performance Reporter" is a light-weight Firefox addon that displays memory and CPU usage of installed addons (extensions) and open tabs in a toolbar panel. Using this extension all the addons and tabs are color coded based on their memory and CPU usage which helps you identifying those consuming too much resources. Where can I see the change-log of this extension? I usually add a summary of change-logs in here. For more through log check the GitHub commit section. Performance Monitor is a new internal page in the Firefox browser that displays slow add-on alerts and resource usage of the browser starting with Firefox 40. The performance monitor divides data into performance related information that update automatically while you are using the browser and slow add-ons alerts which seems to use the new slow add-on notification system that Mozilla integrated in Firefox 38 Nightly. 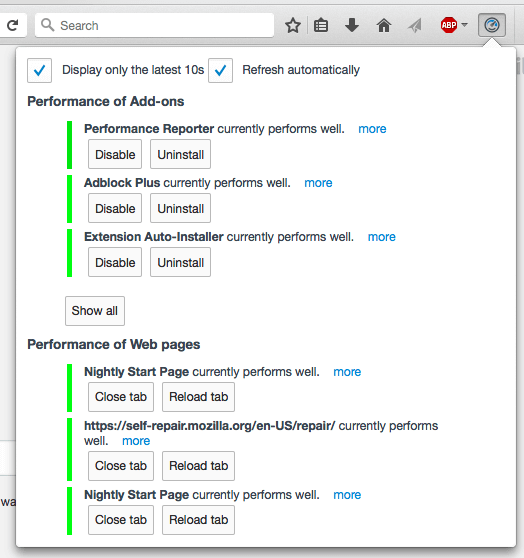 Why Performance Reporter is only available for Firefox Nightly? Performance Reporter is a wrapper to the about:performance built-in tool introduced in Firefox 40.0. Although the UI has slightly been modified to be better presented within a toolbar panel. Where can I find more info about all the perfomance related tools available in Firefox browser? Check https://developer.mozilla.org/en-US/docs/Tools/Performance for more info. Note that this is a technical document. Is Performance Reporter still monitors tabs and extensions while the panel is not shown? No! due to performance enhancement, the UI is completely unloaded when the panel is closed. In fact, the UI is replaced with about:blank to use as minimum memory as possible. How can I request a new feature for this extension? Please read the Help section. The easiest and fastest way to reach me is to open a bug in the GitHub rp. What are the elements in the reporter panel (more technical)?